"Always pursue the path of honor," Grandpa would tell Marky as he bounced up and down on the elder fox's knee. "Believe me, even though it might hurt sometimes, it always pays off in the end." Here Grandpa would always point to the patch covering his left eye, a "war wound," he called it although he always told Marky he wasn't old enough to hear the tale. He'd died five years ago and had never said just where the injury came from. That old fox was always full of life. He'd served in the royal cavalry, a feat almost unheard of for the slave-class anthromorphs. Such prestigious positions were reserved for humans, but that was Grandpa for you. He'd always held high aspirations and demanded the same quality of living from all his family and acquaintances. The king himself had spoken highly Grandpa at his funeral, which stunned the populace to this day. "But what if it kills me?" Marky asked as he stood before the cleft in the rock face. For most of his life he had followed Grandpa's advice, but in a moment of insanity he had made a very bad decision, and now it was time to rectify the situation to the best of his ability. Stale, warm air flowed from the crack, smelling of death. Suddenly the air currents reversed direction and sent fresh cool air into the cave, blowing against his fur and carrying his scent inside. There was no avoiding the encounter now. He gulped. "Here goes nothing." Why was he here in the first place? It went back to that moment of insanity. Marky'd come across a brooch, a trinket really, that fit in the palm of his hand, about a thousand paces down the hillside. It was made of silver, set with a pair of emeralds and a pink ruby. Faint scratches, all that was left of an ancient script, traced a path around the gems and across the back. According to the broker in town, it was worth two blood-curdling shrieks and a "Where the hell'd you get that?" While exploring. Where else? "Don't you know who that belongs to?" Well, in Marky's defense, it was in the middle of nowhere, a ways from the main road. Perhaps a noble had dropped it when passing through the area, and since he'd not come back to retrieve it, anyone who wanted could take it. That was the unofficial law in these parts. Everyone knew that. But then, had a noble really dropped it? Or did it belong to the dragon who lived up the mountain? Even a kit knew the answer to that. One sunset, eight smoldering houses, six splintered barns, and fifteen charred corpses later, Marky stood before the hole in the side of the mountain, brooch in his pocket and knees ready to give out from underneath him at any moment. "Um, hello?" He squeaked. The darkness smothered his voice. "I, uh, I'm here." I'm going to die. I'm really going to die. He hadn't even been able to tell Rebecca he loved her. If she knew who was responsible for the dragon's anger, though, she probably wouldn't be interested. If he had a choice between dying from embarrassment or dying from a dragon's fury, well... At least the second option was quick. "Sorry, Grandpa." Marky forced himself to stand up straight and held the brooch before him. "I'm... I'm coming in," he said. "I'm not going to hurt you." Grimacing, breathing a prayer to whatever deity happened to be listening to a foolish thief, he crossed the threshold into the dragon's domain. An orange glow flickered in the darkness somewhere in the depths of the cave. The beast's breath grew warmer with each step. He could feel the heat beneath his fur now. The return currents snatched the air from his lungs and drove him forward. He stepped over a blackened skeleton and into the main chamber. A mighty copper dragon rested atop a pile of gems and gold at least Marky's height and easily ten times as wide as he was tall. The dragon itself lay curled atop its hoard, wings folded against its back and its nose resting between the spikes on its tail. The dragon itself seemed to radiate with a pale glow, illuminating the entire inner chamber. Fiery orange eyes fixed themselves on Marky, who found himself trembling so hard he could no longer move. "Not many thieves would dare to enter the lair of the dragon they stole from," it said. It raised its head toward the young fox and unfurled its wings. "Such a one would be a fool, or driven by an absurdly powerful sense of honor." It parted its maw in a dragonish smirk, exposing two rows of serrated black fangs. "Perhaps both." "I... I..." Marky pawed at his jacket a few times before successfully penetrating his pocket, and pulled out the brooch. "T-this is yours." "Indeed it is. Three times older than any of the kingdoms within two hundred leagues of my domain, at that, and more valuable than all the kingdoms combined." The dragon snorted and smoke poured from its nostrils. "Bring it to me." Marky remained where he was, jaw slack and drool dripping from his lip. Blackness blocked the edges of his vision. "Perhaps you need encouragement." The dragon stood and growled. "Come here!" Its eyes blazed with light and Marky felt himself compelled to come forward. The next thing he knew, he stood less than an arm's length from the dragon's very open, very black mouth. "The brooch?" "R-right." Marky dropped his illgotten prize to the floor. "Excellent." The dragon placed a claw on Marky's shoulder with enough force to make the fox buckle, but not enough to send him sprawling. "I appreciate you coming willingly. It's such a bother to cause a ruckus sometimes. I'm not as young as I used to be." "I'm not... going to die?" "No! You returned it to me." The dragon laughed. "I suppose you will never do this again?" "Good. Lesson learned." The dragon removed its claw from Marky's shoulder and prodded him backward with his snout. "You should be going. Try not to take what isn't yours." Marky walked backward out of the inner chamber. He did not turn around until he tripped over the skeleton. "You might want to see where you're going," the dragon said. That was excellent advice and Marky decided to heed it. Weak-kneed, Marky stumbled from the dragon's chamber. He was still very much alive, and very much terrified from the whole experience. "I am never touching anything that isn't mine ever again." Now regaining his confidence that the dragon was going to keep its word and not burst out and kill him, he faced the cleft in the cliff again. "I know you said to take the path of honor, Grandpa, but I don't think you meant it literally." He'd be proud. Right? Marky laughed to himself and walked home. 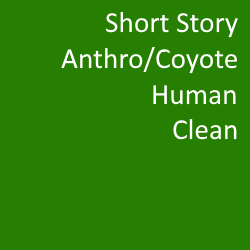 This is a story I wrote for Camp Feral but for various reasons did not make it into the conbook. (This was for the better as the story that made it in was quite good.) They had asked for a "high fantasy" type story. My interpretation of the guidelines follows.